Roadside features were sometimes featured in postcards, such as this 1933 image of the Lester River Bridge. Sometimes Mn/DOT has not found original plans, but simply early design schemes, as shown here in this Christmas Lake Roadside Parking Area sketch. Mn/DOT’s statewide inventory of historic roadside development facilities was based on extensive background research, historic context development, and survey fieldwork. Early in the process, the consultants examined hundreds of documents, photographs and drawings—many of which are still stored in Mn/DOT’s Central Office. They then conducted extensive fieldwork. Because few states had undertaken an inventory of historic wayside rests, new contextual research was necessary to understand the sites and to help determine which were important or unique within the collection. The consultants identified several themes important to the development of the properties: early auto tourism, the promotion of modern highway design, the creation of the Minnesota Department of Highways (MHD) and the MHD’s Roadside Development Division, the role of New Deal federal relief programs in advancing roadside development, and the unique landscape architecture of historic roadside development facilities. The consultants also identified people who played key roles in designing and building these facilities. Once they identified the significant themes, the historical and architectural importance of the roadside facilities began to emerge. The U.S. Bureau of Roads' design philosophy encouraged using local material such as stone for guardrails. The Minnesota Department of Highways, as Mn/DOT was known at the time, was established in its modern form in 1925. During its initial years, the Department focused on simply building and maintaining roads in the state highway system. During this period, a modern theory of highway design began to emerge. Not only was roadway safety emphasized but the principles of landscape architecture were employed to minimize a highway’s impact on its setting and to enhance the roadside landscape. One important aspect of this new design theory was the creation of roadside development facilities. 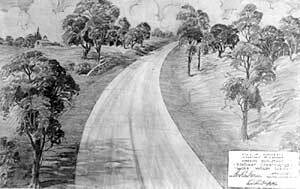 The goals and benefits of modern highway design are depicted in these two contrasting drawings of the same roadway by landscape architect A.R. Nichols. 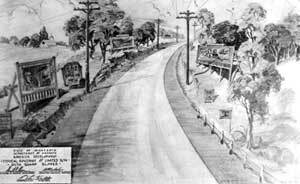 (top) The upper drawing is described as a "Typical Roadway" with limited right-of-way and steep backslopes. The landscape is marred with utility poles, guardrails and fences, and excessive signage and advertising. (bottom) The second drawing is entitled, "Roadway Constructed Under Modern Design." It depicts a safer roadway and one that is aesthetically pleasing through the addition of landscape features and the elimination of intrusive man-made structures. The federal government, through the U.S. Bureau of Roads, was also promoting roadside development. In fact, by 1933 the federal government specified that a minimum of one-half of one percent of all federal highway funds be spent on roadside development. This amount was increased to one percent the following year. Local materials for improving roadsides may be utilized at comparatively low cost ... Such materials include boulders or native stone for guardrails, suitable plant material salvaged in the path of construction operations, careful trimming and cutting of trees, ... and utilizing other objects naturally adapted to the landscape. This new philosophy for highway design was also described in a 1938 study entitled the Minnesota State Park, Parkway, and Recreational Area Study in which it was noted that "... basic consideration in determining the location of new highways and the realignment of old locations are...safety, construction and maintenance costs, preservation of the character of the natural landscape…, and provision of accessory facilities for the pleasure and convenience of the public." It was noted that, "A nation-wide change is occurring in which Minnesota participates." Arthur R. Nichols used this photo entitled "Conservation of Natural Timber in Backsloping" to illustrate vegetation-management principles. 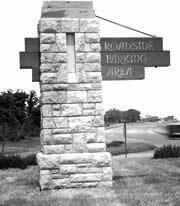 In anticipation of the 1933 federal requirement, the Minnesota Department of Highways established a Roadside Development Division in 1932. Harold E. Olson, an engineer who had been with the MHD for ten years, was appointed to head the new division. Olson assembled a skilled staff that worked to integrate roadside development into highway design and helped make Minnesota a national leader in the field. 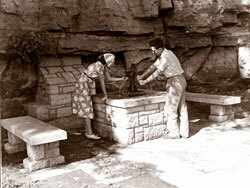 Spring water outlets, as shown in this historic photograph, were common features at roadside facilities along with drinking fountains, pumps, and wells. Built to provide safe drinking water to the traveling public, they were particularly important before gas stations and drive-in restaurants became widespread. The Roadside Development Division tried to bring a "balance of safety, good construction, economical maintenance, and natural beauty" to Minnesota highways and to build roads that were in harmony with surrounding views, topography, and vegetation. One of MHD’s design goals was to make highways safer. They accomplished this by cutting back vegetation to increase visibility, installing ground covers to reduce erosion, flattening slopes to allow traffic to safely leave the roadway in case of emergency, planting "live snow fences" to reduce blowing snow, and providing rest areas for tired travelers. A second goal was to enhance the traveling public’s experience by providing attractive roadways and roadside facilities. The Roadside Development Division tried to route highways through scenic areas and promoted purchasing rights-of-way that were 200'-400' wide, rather than the traditional 66'-100'. Scenic overlooks were built at key vantage points. Natural springs and wells were developed to provide drinking water, welcome signs were constructed at state entrances, and markers were erected to interpret historical events. 1) Make use of "existing scenic advantages" when determining a new highway route that is intended largely for pleasure traffic. 2) Harmonize the road with natural topography. 3) Conserve existing vegetation and trees where possible. 4) Plant new material primarily to control erosion and to provide a "natural transition between construction and nature." 5) Create "outlooks, concourses, parking spaces, picnic areas, historical marker sites, and similar strategic areas where the public can stop for rest and enjoyment." 6) Promote the creation of liberal right-of-way. 7) Encourage separating commercial from pleasure traffic, "thus permitting parkway emphasis and greater latitude in the design of the pleasure route." 8) Control, regulate, and restrict billboards and commercial structures along the highway. Roadside facilities were sometimes built in conjunction with trunk highway construction projects. On popular tourist routes, an entire series of waysides, overlooks, and other features were sometimes built, such as those found on the North Shore of Lake Superior or along the St. Croix and Mississippi Rivers. Harold E. Olson was the head of the Roadside Development Division for over thirty years from its inception in 1932 until 1963. Harold Olson described the efforts of the Roadside Development Division in an article in the Improvement Bulletin dated January 8, 1938 entitled, "Roadside Blemishes Yield to Beauty Treatment." The Division of Roadside (Development) in three short years has seen its work expand until it is as varied as the prisms of a kaleidoscope. A parking concourse overlooking the St. Croix river, a historic marker at the site of an Indian battle, the transformation of a city dump into a municipal playground, a culvert or pedestrian bridge built on pleasing lines, an outdoor fireplace or a rustic table and bench--all may be, and have been constructed, over and over again, with the aid of the Minnesota (Roadside Development Division). CCC enrollees build the massive Gooseberry Falls Concourse on Lake Superior. Courtesy of Minnesota Department of Natural Resources, Hughes and Prudhomme Collection. The Minnesota Department of Highways was an enthusiastic recipient of the unprecedented federal funding and tremendous manpower offered by the federal relief programs of the New Deal. These programs included the Civilian Conservation Corps (CCC), the Works Progress Administration (WPA), and the National Youth Administration (NYA). The partnership worked well because highway work and roadside development projects could utilize large numbers of unemployed workers who could be put to work quickly and with minimal training. Four of Minnesota's CCC camps were established specifically for roadside development work, and a number of other camps were also involved in highway projects. Camp SP-13, established in 1934 near the Cascade River on the North Shore of Lake Superior, was the first MHD-sponsored CCC camp. Both the Roadside Development Division and the National Park Service supervised the CCC work crews. During the New Deal bronze plaques were often installed at roadside development facilities to commemorate their construction. 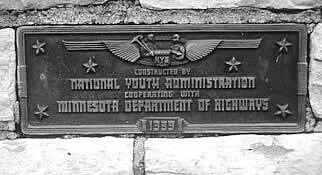 This stylized plaque is located at a wayside rest built on the Mississippi River by the National Youth Administration in 1939. Photo courtesy of Rolf Anderson. The 200-man CCC camps were ideally suited for the construction of large-scale roadside development projects such as the Cascade River Wayside, the Gooseberry Falls Concourse, the Garrison Concourse (part of a series of waysides, overlooks, and bridges near Mille Lacs Lake), and a large stone overlook on Willow Lake near Remer. Programs like the WPA and NYA, typically working with smaller crews, constructed dozens of other roadside facilities in the state. An important aspect of the success of the New Deal projects was their highly collaborative nature. Skills and resources from various agencies were usually combined. At the Garrison Concourse, for example, a bronze plaque credits involvement from the Village of Garrison, the National Park Service, the Minnesota Department of Highways, and the Civilian Conservation Corps. With New Deal assistance, the Minnesota Department of Highways was able to successfully launch a comprehensive roadside development program and fulfill many of its early goals. In a few short years, the MHD built an extensive collection of roadside facilities and improved miles of highway. The recent Mn/DOT study found that more than half of Mn/DOT’s historic roadside development properties were built during the Depression by New Deal programs. It was speculated that without the New Deal programs, this roadside development would have been delayed until at least the end of World War II or perhaps as late as the 1960s. Edward Barber's rustic timber balustrade sensitively protected visitors atop the Gooseberry Falls Concourse, 1936. Park and Recreation Structures, edited by Albert H. Good. Washington, DC: National Park Service, 1938. Reprinted by Princeton Architectural Press, 1999. Presenting Nature: The Historic Landscape Design of the National Park Service, 1916-1942, by Linda Flint McClelland. Washington, DC: U.S. Dept. of the Interior, National Park Service, 1993. Wilderness by Design: Landscape Architecture and the National Park Service, by Ethan Carr. Lincoln: University of Nebraska Press, 1998. Stories in Log and Stone: The Legacy of the New Deal in Minnesota State Parks, by David R. Benson. St. Paul: Minnesota Department of Resources, 2002. (image) Rustic style signs often marked the entrance to rest areas and overlooks. While several New Deal programs furnished the manpower to construct Minnesota’s early roadside facilities, it was the National Park Service (NPS) that helped influence their exceptional designs. Along with technical assistance came one of the most enduring legacies of the Park Service, a design philosophy that we now call the NPS Rustic style. This philosophy was based on the concept that a man-made structure is always an intrusion on the natural landscape, but its impact can be limited through the use of native materials such as log or stone, and a hand-crafted appearance. The Park Service had been experimenting with various styles for a number of years before concluding that the Rustic style was the most appropriate for park design. A NPS publication entitled, “National Park Service Rustic Architecture: 1916-1942,” noted that, "Perhaps for the first time in history a building became an accessory to nature." In May 1933 the NPS opened a branch office in St. Paul called the Minnesota Central Design Office. The office, headed by architect Edward W. Barber, was responsible for providing assistance to develop the Minnesota State Park system and designing hundreds of state park buildings. The NPS office also helped design some of the highway department's facilities, particularly those sites built by the CCC. In Minnesota, the use of the Rustic style resulted in an incredible variety of features built with deeply-hued granite, warm limestone, colorful fieldstone, and even logs, depending on locally available materials. Construction was finely-crafted and labor-intensive, methods generally too costly to recreate today. The subtle qualities of the Rustic style tend to mask the sophistication of the designs. The sites were often planted with native species that were long-lived and required little maintenance. The resulting roadside parks seem to emerge from the natural landscape and appear to be one with the land. Nichols' handsome drawing of the entrance to the Gunflint Trail near the U.S.-Canadian border demonstrates his design and delineation skills. Arthur R. Nichols was the consulting landscape architect for the Minnesota Department of Highways from 1932-40. He became one of the state's most important landscape architects. Courtesy of Greg Kopischke. While the U.S Bureau of Roads and the National Park Service provided a philosophical framework for highway and roadside design, individual designers were responsible for interpreting and implementing these ideas. The Minnesota Department of Highways was fortunate to call upon the skills of Arthur R. Nichols, perhaps the most productive landscape architect in the history of the state, and one of the individuals credited with establishing the field of landscape architecture in Minnesota. Morel and Nichols’ list of achievements is lengthy. The firm designed dozens of parks, city master plans, residential subdivisions, civic centers, and college campuses. They also designed private estates, country clubs, cemeteries, and parkways. In 1926, after Morell’s death, the firm consulted on the location, grading, and landscaping of proposed roads in Glacier National Park and designed the grounds of the popular Glacier Park Hotel. Nichols became the Roadside Development Division's first Consulting Landscape Architect in 1932. The study found that Nichols designed most of the division's waysides, scenic overlooks, and historical markers built during the 1930s and ‘40s and helped formulate the division's early policies and goals. As the principal designer during the division's first decade, Nichols had a tremendous impact on the state's roadside development work. Nichols was also a leading figure in the new roadside development movement nationally, as well as a spokesman within Minnesota. His training in both civil engineering and landscape architecture gave him the practical training and technical knowledge to design safe and efficient roadways that preserved and enhanced the scenic qualities of the landscape. In 1940 Nichols wrote that it is "more and more imperative to provide turnouts, overlooks, and roadside parking areas where the tourist may rest and enjoy the scenery with a full degree of safety." He commented that roadside development facilities, "when carefully planned and developed, can be convenient, restful, and impressive. They become an asset to the traveling public." After a long career, Nichols retired in 1960 at the age of 80.